TV footage of the heavy snowfall down south included shots of 4WDs in ditches or slithering helplessly, visual proof that contrary to a widely held belief, having drive to all wheels isn't a magic carpet solution to all adverse driving conditions. 4WDs are subject to the same laws of physics as other vehicles; when there's no traction (friction), they aren't going to go anywhere. Chains, however, can make a big difference. 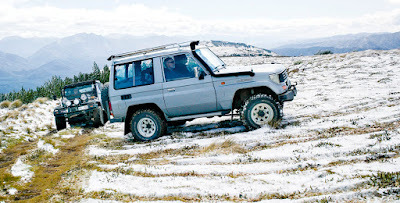 In his excellent 2004 book, The New Zealand 4 Wheel Drive Handbook (ISBN 1-877251-24-0), Ken Sibly writes: "It goes without saying that if you are driving off-road in snow or icy conditions, chains should be fitted to at least the front wheels so that you steer the vehicle. A full set is preferable." Turning off onto the snow: chains not needed here, but it could get worse. He notes that grippy tyres and 4WD capability will take the vehicles much farther than conventional cars, but are still subject to physical and mechanical laws of sliding, wheelspin and reduced handling ability. 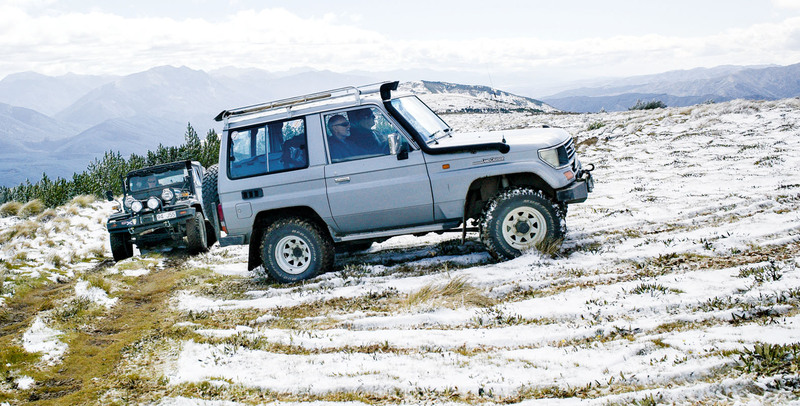 Driving techniques in snow and ice are similar to those for mud or wet grass. Select the highest practical gear and use the least-possible throttle. "Drive as if you have no brakes … use the engine and gears for braking," advises Ken Sibly. "You need to take great care to avoid sudden braking and hard steering, or you will go into a skid."